Borneo fern collected by Alfred Russel Wallace. 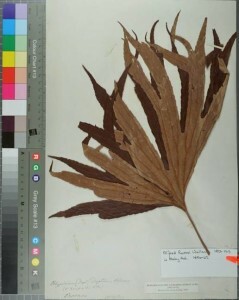 Part of the Katharnie Murray Lyell fern collection. Mrs Katherine Murray Lyell (1817-1915) was a British pteridologist. Born Katherine Horner in 1817 she later married Henry Lyell, brother of Sir Charles Lyell, the president of the Geological Society (who married Katherine’s sister Mary Horner). Katherine Murray Lyell was avidly keen on ferns, collecting specimens from around the world and corresponding with many well known naturalists including both Darwin and Wallace. She wrote the book A geographical handbook of all the known ferns (1870) as well as editing the Life and Letters of Charles Lyell (1881). Lyell’s fern collection at University of Reading includes specimens from many famous biologists including Odoardo Beccari and Alfred Russel Wallace. 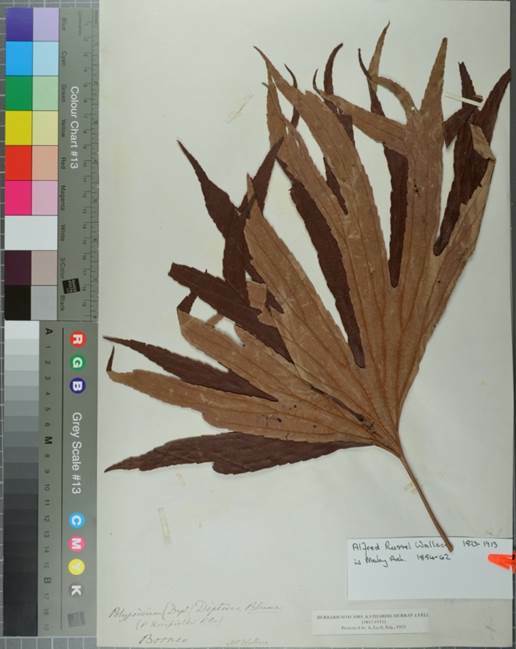 This entry was posted in Collectors, Herbarium RNG and tagged Alfred Russel Wallace, Charles Darwin, Odoardo Beccari. Bookmark the permalink.